Those who organize academic conferences in the social sciences and humanities will sometimes admit that the most effective way to attract large numbers of presenters is to announce that your theme is “the border.” Borders are the lines that demarcate national states, of course, but scholars will use the term to name lines of demarcation of all kinds—those that run between literary genres, sexual identities, areas of the psyche, and academic disciplines themselves. One challenge of the interdisciplinary field called “border studies” is to slow down a proliferation of metaphors that turns every category, thing, or relationship into one involving borders or their transgression. One of the many strengths of Looking Beyond Borderlines is that it steers close to a meaning of “border” in its limited, geographical and political sense. This dense, well-researched book is about the boundaries between national territories, with a particular focus on the United States and its northern and southern frontiers. Lee Rodney resists the rhetorical flights that lead scholars to find borders everywhere, but she nevertheless succeeds in rendering her political borders richly multidimensional. As this book shows, international borders do more than just divide. They also gather around themselves practices and structures of various kinds: civil-society activism, technological infrastructures, architectural experiments, and artistic interventions large and small. International borders, Rodney argues, have always been caught up in successive regimes of visuality, which have shaped the ways in which borders are established, policed, and represented. As she shows, official photography supplemented the first cartographic border surveys in North America, which were conducted in the late nineteenth century. If these photographs helped transform visual landscape into political territory, they did so in implicit collaboration with landscape painting that, in W. J. T. Mitchell’s words, did the “dreamwork of nationalism,” adding myths to measurements. A century later, we confront a wide range of media representations of borders, often centred (in fictional texts, in particular) on the figure of the immigrant and border-crosser. We are all familiar with those scenes of cinematic suspense in which a vehicle bearing illicit human or non-human cargo slowly approaches a border checkpoint. In such scenes, the border is made visible as a set of intensely interwoven material and affective forces. Aerial views of borders may render them as visible scars cutting through “unique landscapes and ecosystems,” but this sense of the border as a simple line of fracture is balanced by the ways in which borders are also networks of control that involve iris scanners, drones, surveillance planes, inland checkpoints, and a myriad of other vantage points and technologies of vision. The various studies offered here all contribute to the book’s broader project of an aesthetics of the border. This is not, Rodney is quick to note, an aesthetics of sublimity or power, preoccupied solely with the majestic scale or political trauma of international boundaries. In a more subtle fashion, she sets out to analyze borders within a framework rooted in Jacques Rancière’s account of the relationship between politics and aesthetics—an account that wilfully maintains an uneasy relationship between these two terms. Art is political in the ways in which it enacts a “distribution of the sensible”; borders, with their sights, sounds, spectacles, and immersive environments, offer rich terrains in which to investigate this distribution. The central chapters of Looking Beyond Borderlines examine a wide variety of artistic works and museological projects in terms of the ways in which their particular interweavings of the “sensible” make borders into sites of consensus and dissensus. An artistic work like Santiago Sierra’s Submission (Formerly Word of Fire) (2006), which inscribed the Spanish word for “submission” in large trenches outside of Ciudad Juárez, functioned as a dissensual intervention by requiring the reader of the word to face southwards, towards Mexico City (the site, for Sierra, of the Mexican government’s capitulation to NAFTA) rather than north, towards the United States (the conventional direction of the aspirational Mexican gaze). More broadly, the work disrupted perceptions of NAFTA as a force for cross-border mobility by highlighting the extent to which the right to cross belonged to capitalist commodities but not to people. 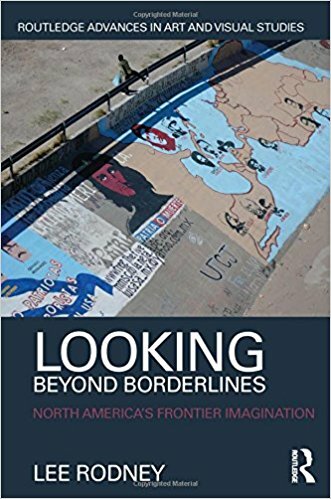 One of the most engaging chapters in Looking Beyond Borderlines is the second, “Homeland as Home Front: Terror, Territoriality and Television.” It deals with television and entertainment media, and would be an effective reading for courses on fictional treatments of the US border. Rodney begins this section by noting that, prior to the creation of the US Department of Homeland Security in 2002, the word “homeland” had made no appearance in US government documents. Its peculiar emergence in the early years of the twenty-first century coincided with the rise of what Lee calls (following Todd Miller) the “Border Patrol Nation,” a national collectivity driven by fear to fetishize any means (official and unofficial) of maintaining the integrity of national borders. In the social-political realm, this fear manifests itself in the emergence of groups of self-proclaimed defenders of territorial integrity, like The Minutemen. On television, it expresses itself in the popularity of narrative series like Homeland, whose title signals the ascendant resonance of the term, and The Bridge, which is set on the border between Juarez, Mexico, and El Paso, Texas. While both these programs were critical of hegemonic forms of border-centred state paranoia, they should be seen, nevertheless, as contributing to a cultural moment in which the border became central to national consciousness. The book’s third chapter, which analyzes museological projects established along borders, is somewhat unsettling (and slightly reassuring). We learn that, alongside their transformation into nodes of high-tech control, borders are still the site for almost endearingly clumsy museum exhibits and architectural facelifts. Rodney discusses several projects here. One is the 2006 travelling exhibit “Thresholds Along the Frontier: Contemporary Border Stations,” which the US General Services Administration mounted as a way of putting a friendly face on the border and calming the alarmist climate that had set in since 9/11. The exhibit featured new designs for border headquarters; one of them, at the crossing between Cornwall, Ontario, and Messina, New York, was to feature a giant sign with the words “United States” in what Lee describes as yellow, pop art-like lettering. (The sign was removed a month later due to security concerns.) And, far from the tightly managed propagandistic monuments one might have feared, the Checkpoint Charlie Museum in Berlin, and Border Patrol Museum in El Paso, Texas, are shown to be eccentric, private museums shaped by the idiosyncratic collections of their founders, who are oblivious to standards of museological exhibition and preservation. Key sections of this book deal with the northern and southern borders of the Canadian State. Rodney traces the growth of concern for Canadian sovereignty in the Arctic, rooting it partly in efforts by the Harper government (2006–2015) to make Arctic sovereignty one basis of a resurgent, conservative nationalism. In such a nationalism, Canadians would be trained to look to the North as the site of collective aspiration, rather than to the South, where we find only the evidence of our historical inferiority and subservience. Harper’s Nordic nationalism, Rodney shows, ran counter to a “more critical, post-national understanding of the country that includes indigenous and alter-globalization movements that have further cut through the fictions of Canadian nationalism.” Artistic manifestations of this resistance are to be found in the paintings of Lawrence Paul Yuxweluptun and the performances of Rebecca Belmore, which are examined in detail here. Rodney, who lives and works in the border city of Windsor, Ontario, has been involved in artistic interventions along the Windsor-Detroit border for several years. The book’s final chapter looks at a number of artistic works and interventions centred on this border region, from Ron Terada’s installation of a bilingual sign bearing the words “You Have Left the American Sector” through the ongoing efforts of the Windsor-based Broken City Collective to alter the visible presence of the Caesar casino complex, whose signage had disrupted lines of sight across the Windsor-Detroit border. Finally, Rodney takes up the work of Detroit-based, Métis artist Dylan Miner, whose project La (otra) frontera “relocated” the southern border of the United States to the north by documenting the rich presence of Chicana/o culture along the nation’s northern edges. In one of this book’s most poignant observations, Rodney notes how the engagement of artists with borders—and with the US-Mexico border in particular—has changed over the last thirty years or so. As she observes, it was common in the 1980s and 1990s to treat borders as places of mixing and indeterminacy, as incubators for new, fluid varieties of “border culture.” The most influential example of this treatment was offered by the Chicana scholar Gloria Anzaldua in her widely read book of 1987, Borderlands/La Frontera: The New Mestiza. For Anzaldua, the regions between nations and cultures encouraged a destabilization of deeply rooted identities (of genre, sexuality, and race), and while this might make them places of loneliness and precarity, these borderlands were also laboratories in which new, mestiza identities might emerge. In the wake of Anzaldua’s work, Rodney shows, literature and performance were the artistic forms most engaged with the condition of life on the border. This would change after 2001, when rising perceptions of a threatened US homeland and the consolidation of the security state severely challenged any sense of borderlands as spaces of fluid invention. Since then, the author notes, the art forms engaging with the border are those most able to engage with the solid materiality and militarization of border complexes, particularly along the frontier dividing the United States and Mexico. These include new forms of activist architecture or social engagement and works of tactical intervention. No longer able to celebrate the liberating potential of borders as spaces “in between,” artists now work to challenge or expose the border’s new status as front line in the geopolitical operations of the paranoid state. Will Straw is James McGill Professor of Urban Media Studies in the Department of Art History and Communications Studies at McGill University.